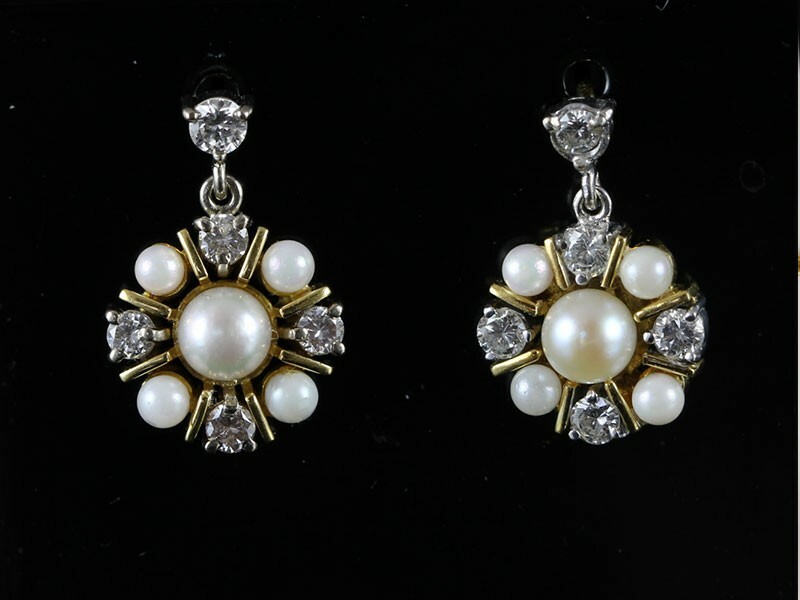 Elegant, feminine beauty radiates from these fabulous cluster ear drops. 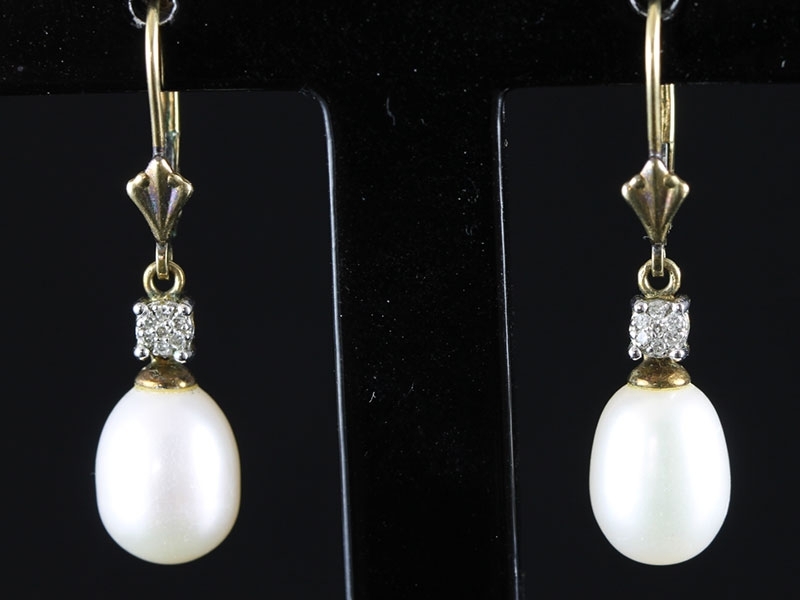 Masterfully created in 18 carat Gold which accentuates the the beauty of the natural Pearls and dazzling Diamonds. 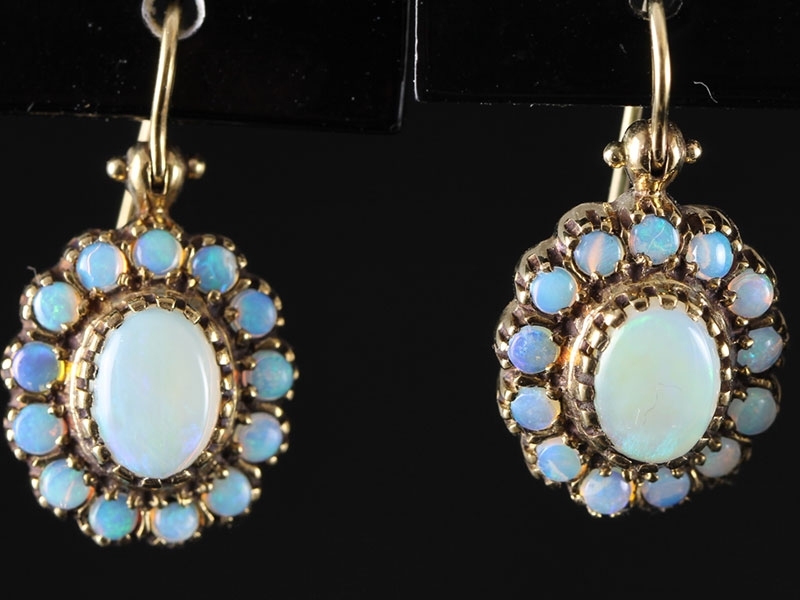 These gorgeous, Victorian style, 9 carat yellow Gold Earrings boasts a trio of cultured, colourful pear shaped Opals. 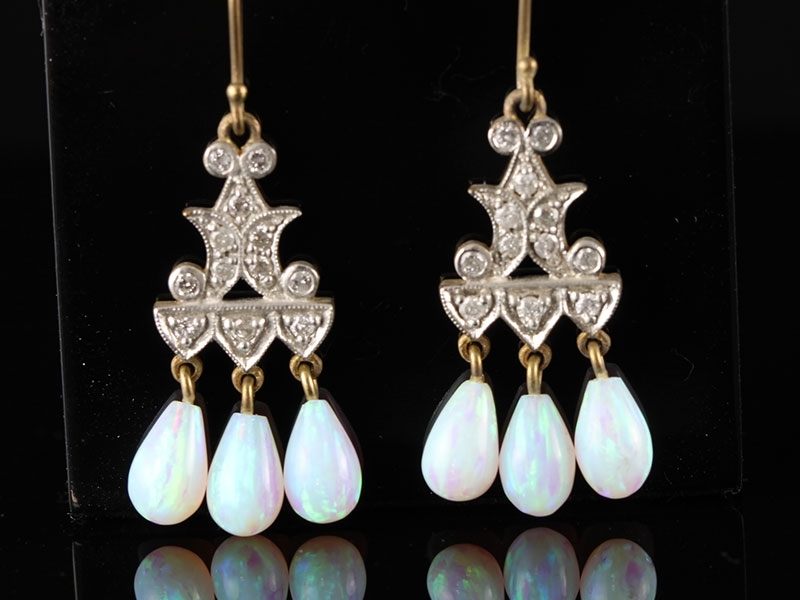 These beautiful Opals are suspended by an ornate Diamond embellished Victorian inspired handcrafted design. It's love at first sight. This pair of stunning Amethyst drop earrings exude elegance and sophistication. They glisten and are complimented by sparkling Diamonds and the warmth of Peridots. Bold and beautiful, simply stunning. 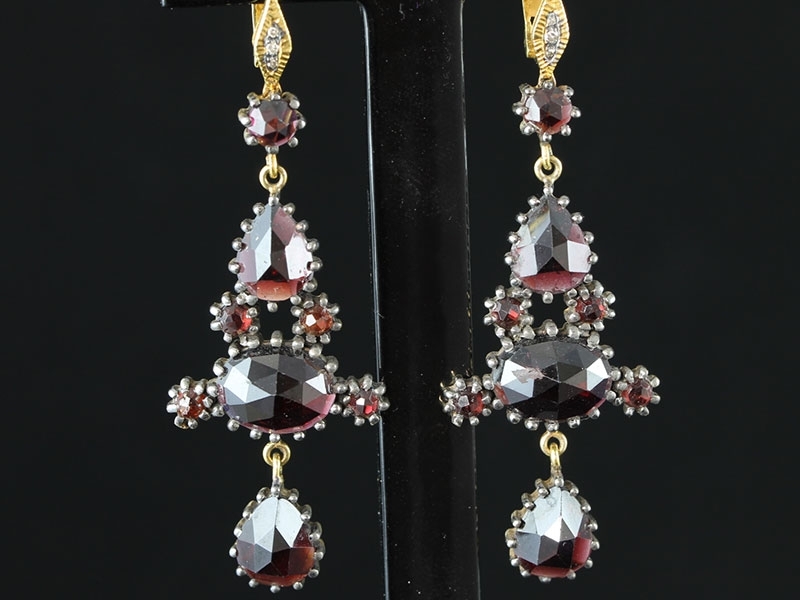 This is a remarkable pair of Victorian inspired Bohemian Garnet earrings. The design that is bold and beautiful. Simply stunning and not to be ignored. 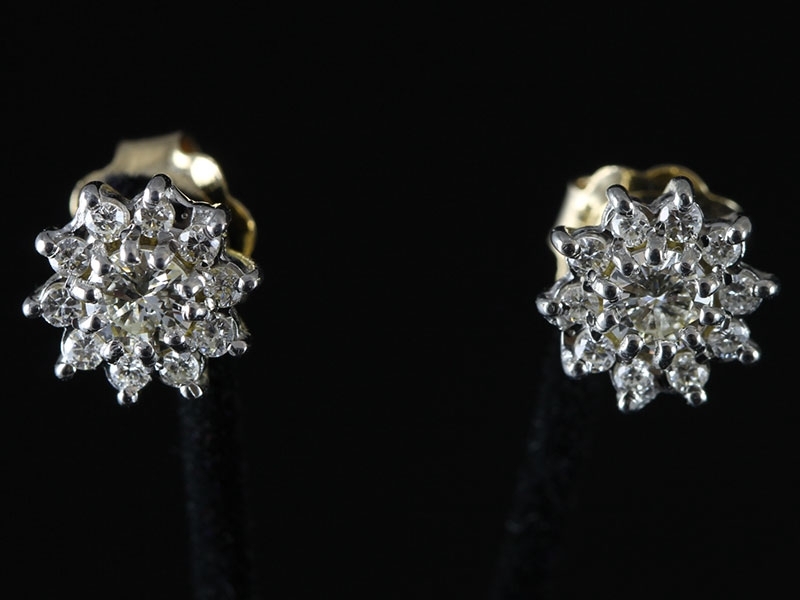 A pair of elegant yellow Gold and Diamond leverback earrings, featuring a beautiful 7 stone Diamond daisy cluster in each earring, totalling 0.07 carats. 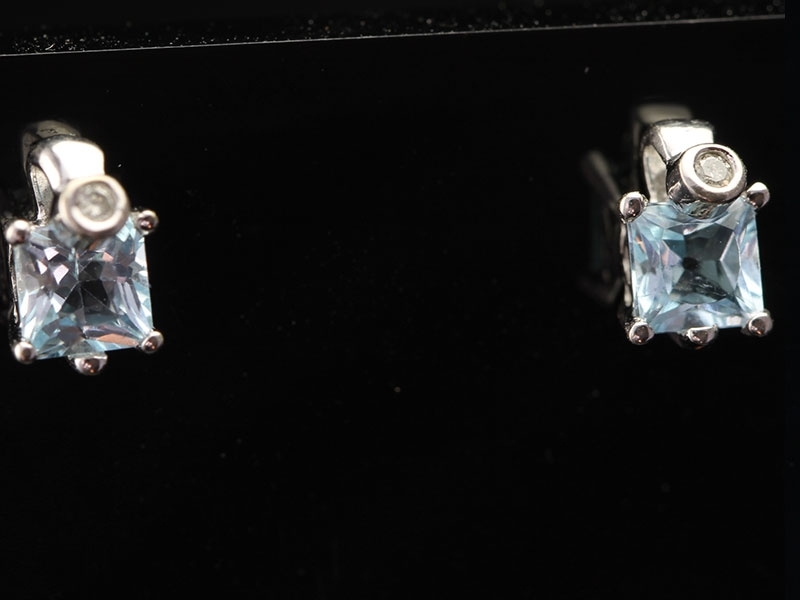 This set of beautiful Emerald cut Aquamarine and Diamond earrings displays classic elegance. 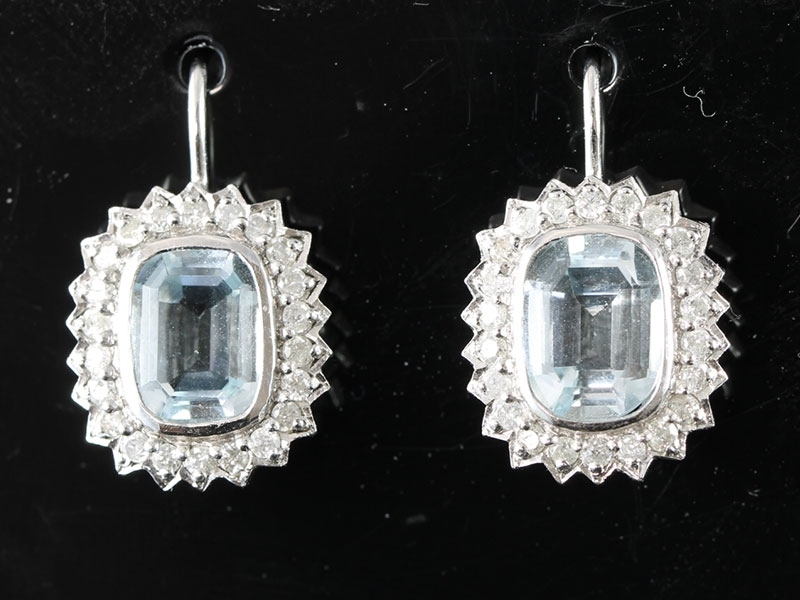 The two stunning Aquamarines are one carat each and are surrounded by 22 sparkling Brilliant Cut Diamonds. These striking earrrings have all a girl could wish for! 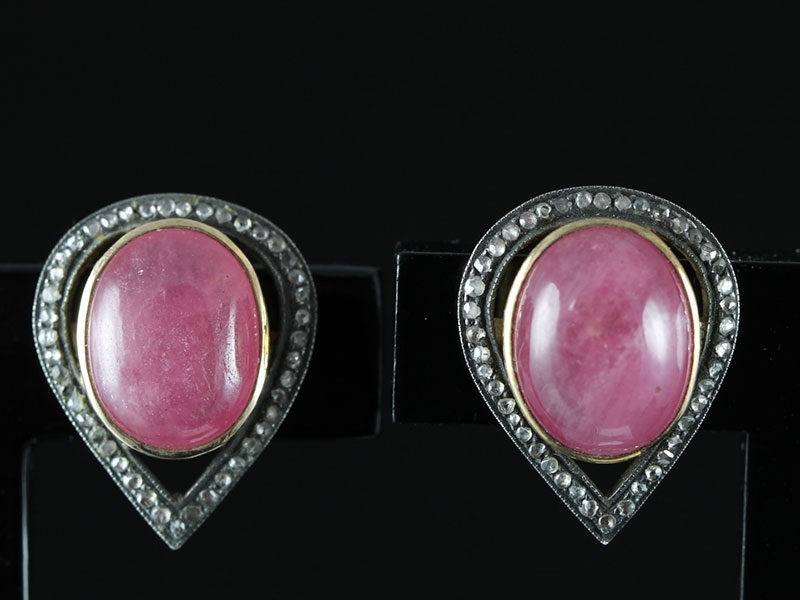 These fabulous eye catching pair of cabochon Ruby and Diamond earrings are simply lovely. 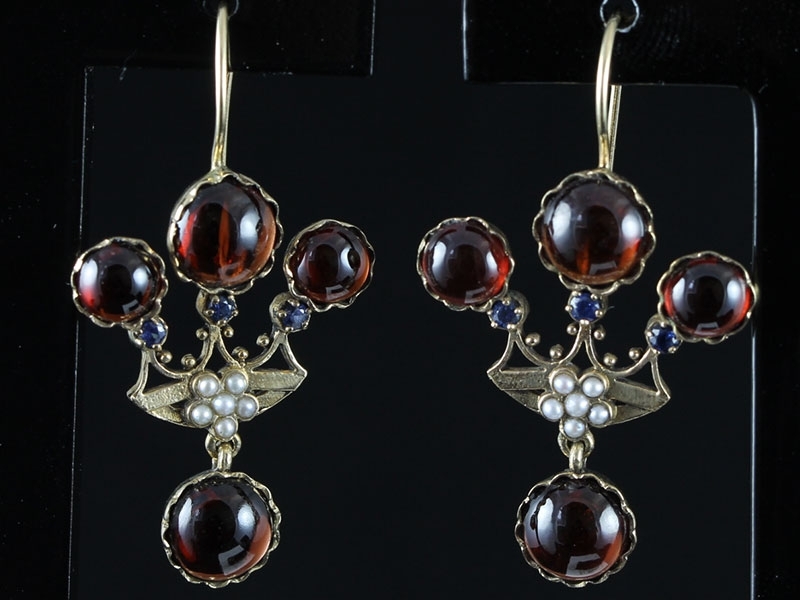 These stunning 15 carat yellow Gold earrings boasts 8 fabulous Cabochon Garnets. The central Garnets are 1.50 carat each with 0.75 carat either side of the central Garnet and the bottom garnet is 1.75 carat in size. 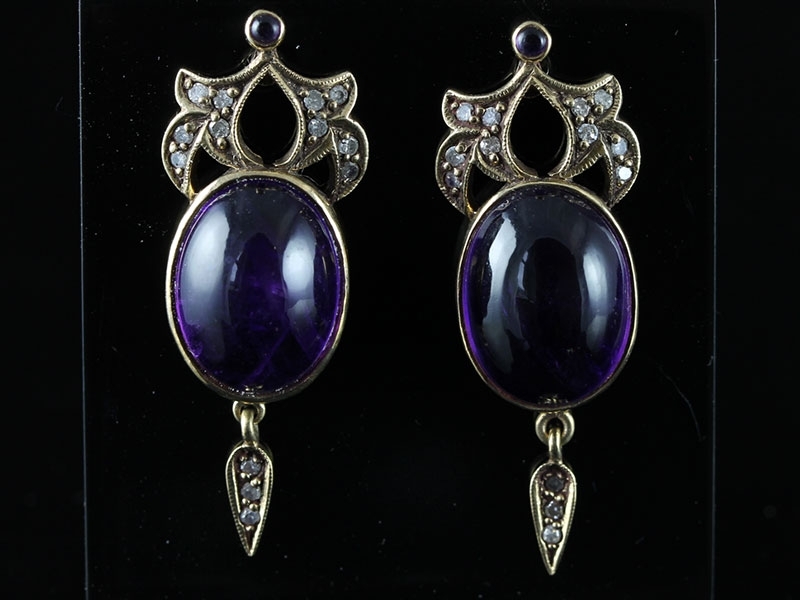 Simply lovely pair of Victorian inspired large Cabochon Amethyst and Old Mine Diamond Earrings. These stunning 9 carat Gold earrings boasts 2 large collet set Amethysts measuring 10mm in width and 15mm in length. 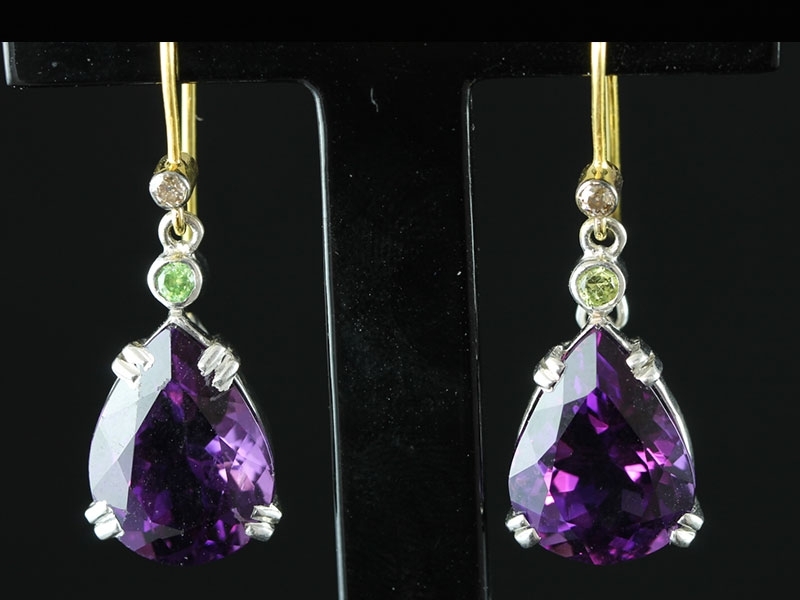 At the top of the earrings are a further 2 collate set Amethyst which are a total 0.04 carats in size. This gorgeous pair of high-voltage tulip design sparklers are comprised of 0.34 carats of Modern Brilliant Cut sparkling Diamonds. 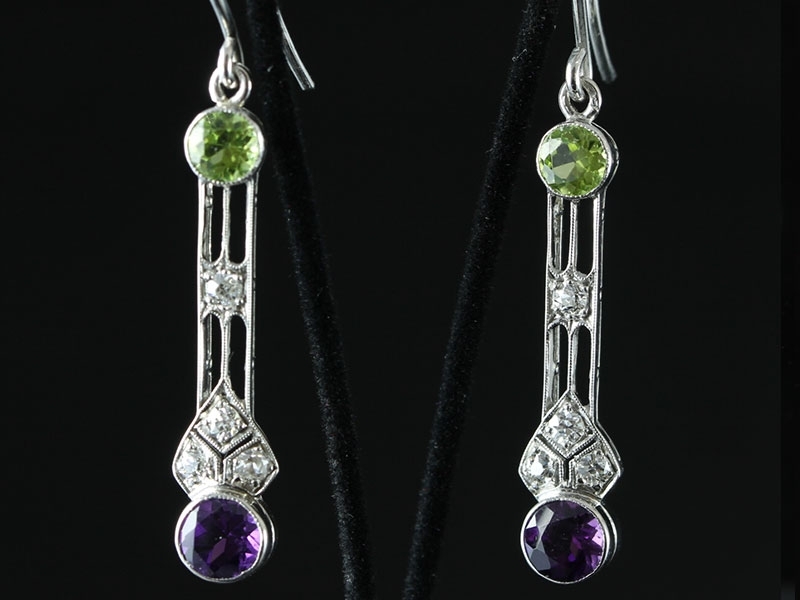 A streamline and sophisticated pair of Diamond, Peridot and Amethyst drop earrings hand crafted in Platinum leading to an 18 carat White Gold shepherd hook fitting faithful emulation of ever enduring 1920s Art Deco style. 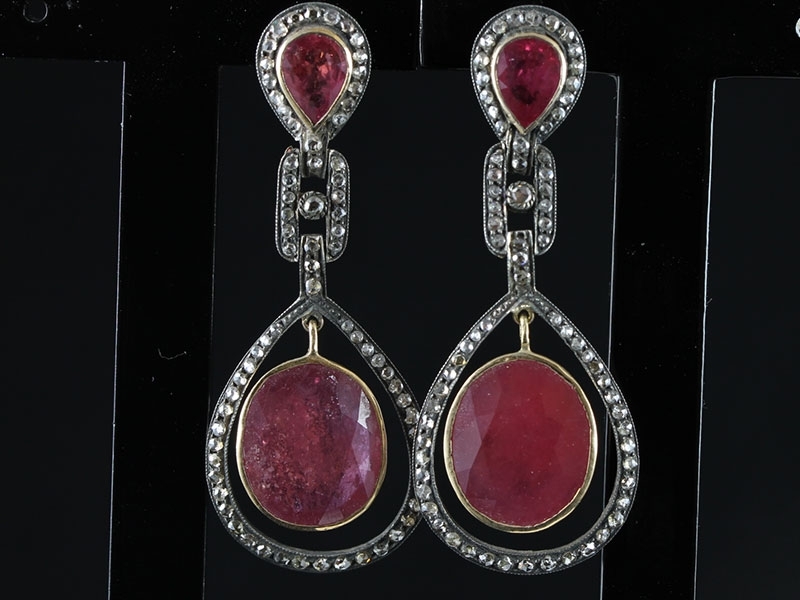 A dramatic and stunning pair of Victorian inspired Ruby and Diamond earrings which are beautifully hand crafted in yellow Gold and Silver. An elegant pair of 18 carat yellow Gold stud earrings set with a daisy cluster of sparkling bright white Diamonds totalling one carat. 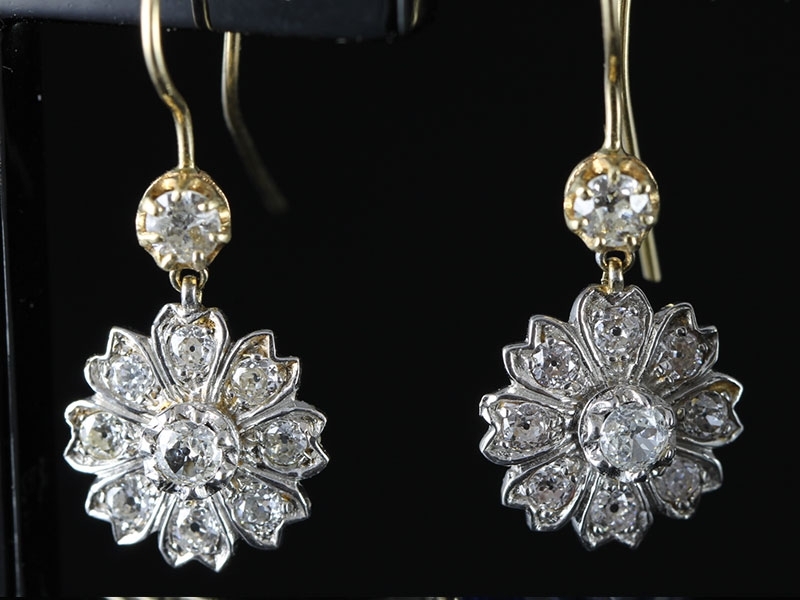 Radiant 15 carat yellow Gold sparkling Diamond flower cluster drop earrings which would make a stylish and sophisticated match for any occasion. 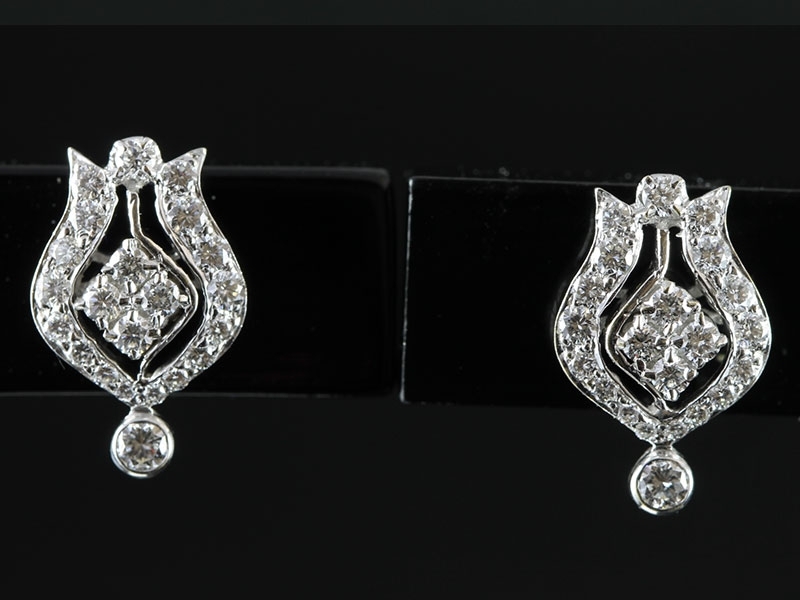 These unique Diamond drop earrings boosts a long decorative drop with astunning pear shape Diamond at the bottom of a Diamond collet bar, with a butterfly fitting. 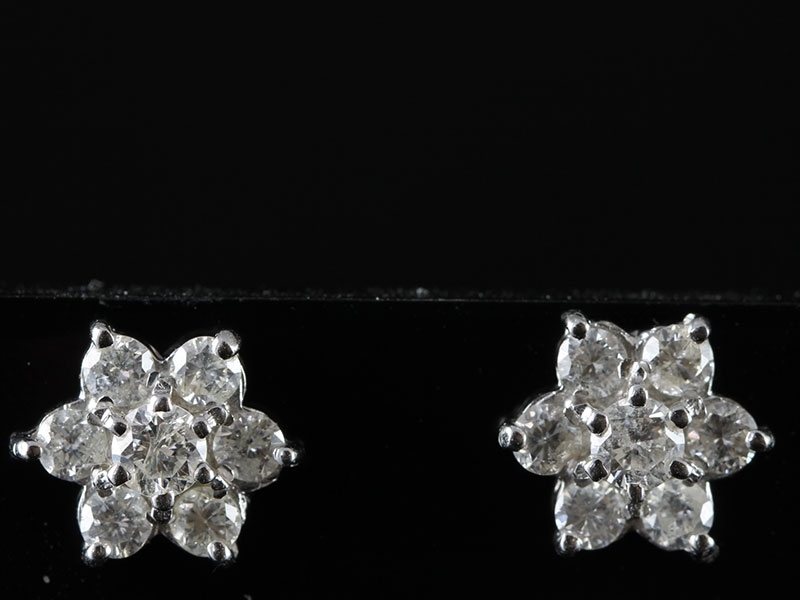 These stunning beautiful �Flower Shaped Diamond Cluster Stud Earrings have clusters of sparkling Diamonds in the form of a flower. 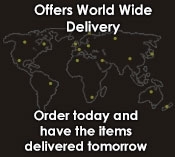 These high quality earrings can be worn to the office or out on the town. A pair of magnificent Colombian emerald cut Emerald and Diamond 18 carat Gold earrings. 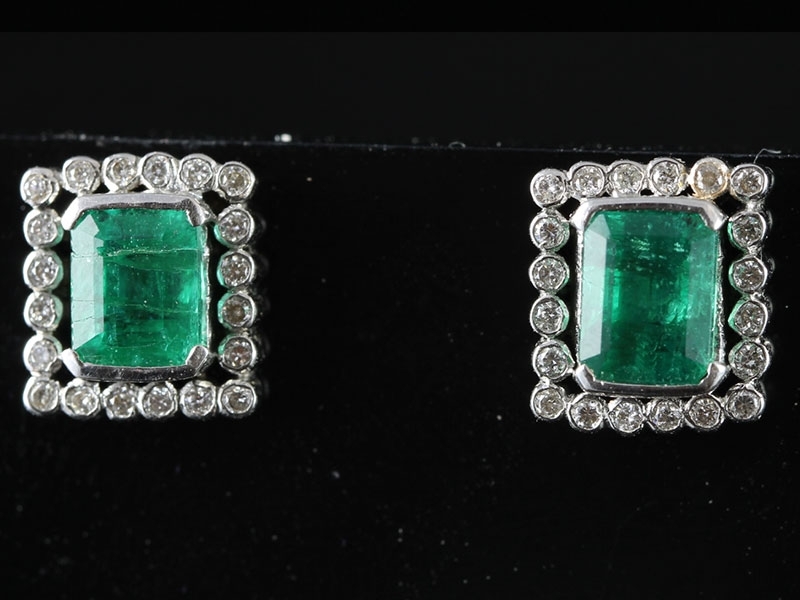 These beautiful pair of Emeralds are a lively "open colour" which is a fresh vivid deep rich green. These elegant solid Opal earrings reflect colour in their stones but still retain that milkiness lovers of white opal are after. 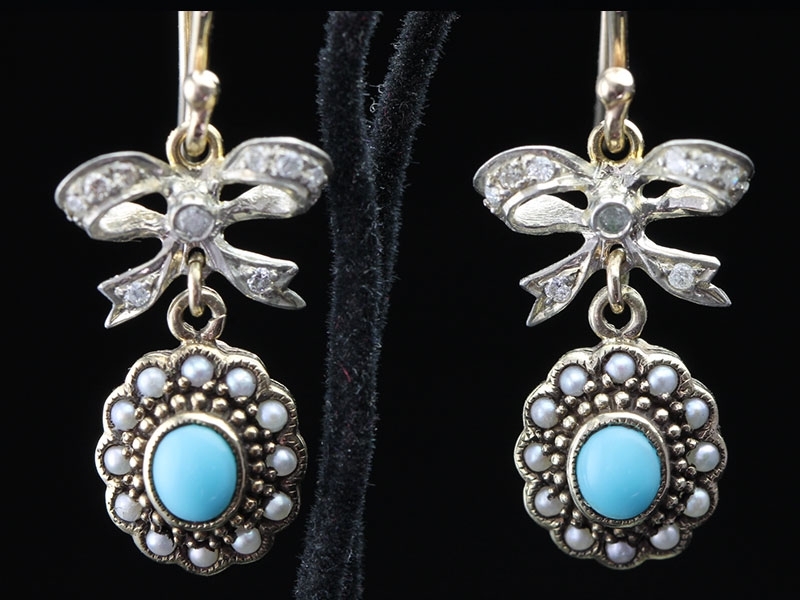 Elegant and sophisticated these Diamond, Turquoise and Seed Pearl drop earrings will look great with any classy outfit. 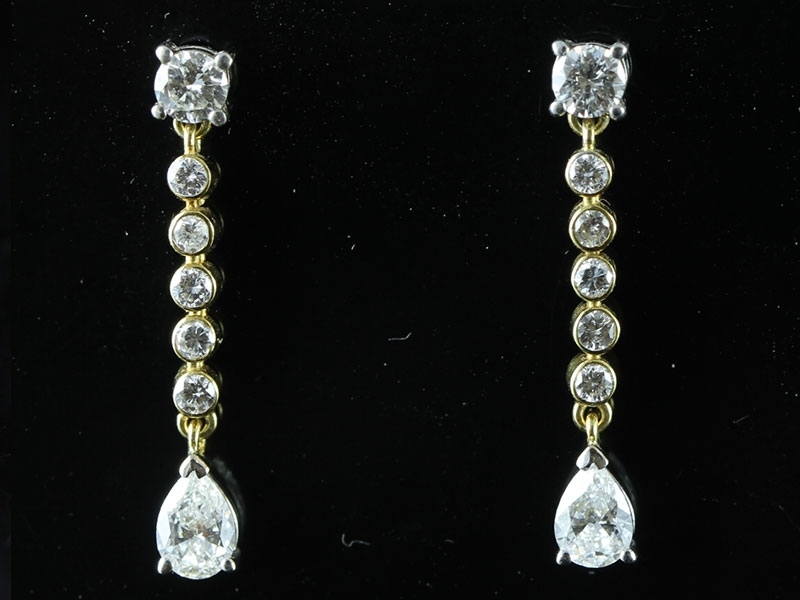 Feel like one in a million wearing these fabulous white 9 carat Gold stud earrings. The contemporary design, sparkling Diamonds, shimmering Aquamarine gemstones and easy to wear stud design will leave you feeling truly gorgeous.